Today was one of those perfect days. I woke up early, had my fresh cup of coffee and headed out to Super Target for some groceries. As I shopped, I managed to figure out a delicious menu for today’s dinner. 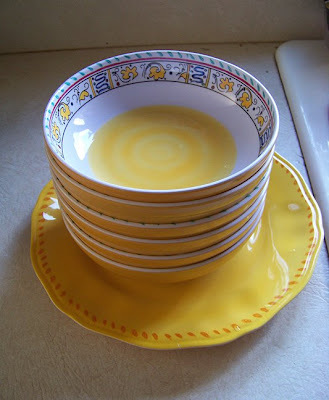 While I was miandering throughout the store looking for good clearance deals, I stumbled upon some beautiful melamine-style bowls in the happiest shade of sunny yellow. They even had a French print around the inside top. I was smitten and had to grab 6 of them. They were only $1.98 each. What can I say? They made my heart happy-I was a bit breathless at the site of them. This was one of those days I couldn’t rationalize myself out of a purchase. Luckily, it was a ‘cheap’ thrill! I also picked up a matching platter and one lone plate that was the same sunny yellow as the bowls. I tend to be a rescuer of orphaned dinnerware, so the fact that there weren’t any others to go with it didn’t bother me at all….I just placed it in the cart and headed for the checkout lane. After I paid on my way out, a Target associate stationed at the exit was giving away free samples-or should I say free pints of ice cream. I took two….what a great treat! The flavors were a bit exotic, they were two new ones by Archer Farms-Sea Salt Pretzel with Carmel and Espresso Chocolate. Their names might explain why they were free, but I’ll see for myself when we eventually get to taste testing them. I got home with my lovely new dishes and promptly removed the price tags and labels and washed them. I made a spot for them in the cupboard. Do any of you have this same feeling of bliss, brought on by new kitchen stuff? There’s something about those dishes that just made me want to make an attractive, simple meal and serve it up in the new bowls. And that’s just what I did. I got my entire kitchen cleaned up, shiny happy and looking new. The sun was out today, the temperature perfect and I felt great. Goes to show you that a little retaill therapy can be an actual mood enhancer. I hit the gym and for 1/2 hr. exercised on the elliptical. Maybe I was full of endorphins and those, mixed with the new melamine, set my heart a blaze….I don’t know. My shower felt good, I jumped into some new clearance clothes nabbed at Old Navy the other day. I just feel happy-even still. I ended my day on a cozy spot on my sofa watching my beloved Cub’s sweep the rotten Chicago White Sox 3 games…..it was a glorious end to a glorious day. Hmmm….what will tomorrow bring? p.s. Get your MORE magazine for July. I want to write about Jamie Lee Curtis. She has totally inspired me. You have to read the article on her. She is such a cool, together and smart lady. Next postMonday at the Arboretum….oh, and the BUGS! Wow! Your day made ME happy! LOVE the dishes! I never can resist Target’s dishes, Em! Every time I go IN there I see dishes I want! By the way, I saw your comment re: The Mermaid Chair on another blog & wanted to tell you it’s good! NOT as good as The Secret Life of Bees, but a good read! If I still had my copy I’d send it to you but I already gave it away.